Auto insurance carriers, agents and brokers. U.S. and Canadian insurance policies are not recognized here. Sanborn’s Mexico Car Insurance: Mexico car, boat and home insurance. If you’re going to drive in Mexico, you need Mexican car insurance. Your US or Canadian car insurance is not enough. You’ll need to get liability coverage issued by a Mexican Insurance Company. Mexico boat, vehicle, and home insurance. Medical insurance policies are also available. 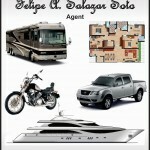 If you have any questions about purchasing boat, car, Motorhome (RV), motorcycle, home insurance, or medical insurance in Mexico, you can talk to bilingual insurance agent Felipe A. Salazar Soto. Felipe is located in the Catch 22 office in Marina San Carlos.